When Rich Peverley collapsed and had to be resuscitated in the tunnel behind the bench during the March 10th Dallas Stars and Columbus Blue Jackets NHL game, his extreme medical emergency didn’t just draw massive attention because everyone thought they’d just watched a hockey player die live on TV. It also set off an unprecedented conversation regarding hockey fans being racists. This all stems from the fact that when Peverley was shocked with the defibrillator and woke up after suffering from an extremely irregular heartbeat, he asked his coach how much time was left in the period and if he could get back in to play. Everyone attributed this to the notorious work ethic of hockey players, but when I heard about Peverley’s question to his coach, I actually just assumed that he asked about the game because he was disoriented and deprived of oxygen. I laughed at the story because imagine you were the coach who essentially watched his player die, and then he wakes up and asks that. Then this meme showed up. I’m not going to lie; I immediately posted it on my Facebook. I posted it because for years I was the American kid getting shat on by people in my middle and high school for liking hockey, and while baseball and basketball players would take weeks off for breaking a toe, some of my favorite hockey players would break an ankle at the start of the playoffs and still be skating on it while they lifted the Stanley Cup over their head. I respected their work ethic and special brand of insanity. Quite frankly, the meme made me laugh. Then articles starting appearing on Deadspin, and The National Post’s website about the meme. The thesis of many of these articles are all basically the same; you’re comparing apples and oranges with these two athletes, hockey fans are insecure and they are all a bunch of racists for making the comparison between Peverley and James. Hockey fans were declared as showing that yet again, they are intolerant and inferior for trying to turn this into a hockey vs. basketball debate. Whatever, I know we are never going to win that debate, but let me tell you a little story. I lived in Canada too, and of course you hear kids saying they want to become hockey players when they grow up there as well. Interestingly enough, at my university (and I think the vast majority of Canadian universities), you could not receive full-ride scholarships for playing university level sports, of any kind.That alone made such a difference up north. The priority was always academics, so you could play the sports. 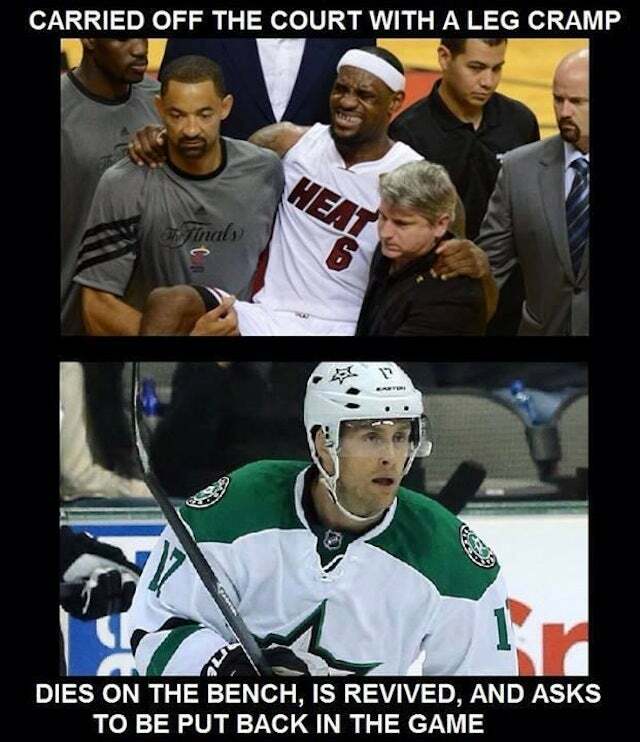 We can argue all day whether the Rich Peverley/Lebron James meme is racist, and maybe it is. But I don’t think we can really have that conversation without looking at the bigger picture. Why are millions of African-American boys in this country convinced that that the only way to be successful in America is by hooping? Because it’s the reality– structural racism has made it so. Those of us in positions of privilege and power have created and maintained this narrative for many because of the extreme cost of college. Even more so, we’ve created a narrative where 1 in 4 black men in this country go to prison, so obviously spinning the wheel and hoping it lands on NBA makes sense for many. Basketball players are what these young men want to become, not only because it’s fun and earns you million of dollars, but because when you consider that many of their parents put in more work than Lebron ever will and they walk home with less a year than he makes in a single game. Who the hell wouldn’t want to be paid nineteen million a year (plus almost forty million a year in endorsements) and be allowed to take a day off when you get a bad leg cramp? The parents of the students I work with routinely work three jobs at minimum wage, doing repetitive, back-breaking work, and can’t take days off for the flu, migraines, or even major injuries. If this is what your parent has to do to “make a living”, of course you’d want better than that. The sad thing is that some of these students’ parents didn’t graduate high school, but a hell of a lot of them did. Worse than that, a lot of them went to college, but just did it in a different country that we’ve declared would never measure up to our educational standards. If you want to call hockey a racist and exclusive sport due to the fact that it is cost prohibitive for many families, fine, I will give you that. (Middle of the road gear will cost you approximately $1,500 dollars a year depending on how your kid grows. If you have a goaltender in your family—you’re really screwed. ) But if we’re going to play this blame game, then you must be willing to evaluate the racist structure of the NBA, the plantation model it’s been following and the trickle down effect it has on youth today. Seventy-eight percent of NBA players are African-American, but Michael Jordan is the only non-white majority owner in the NBA. The message African-American youth are taught in this country is that if you can run fast enough, jump high enough, put the ball through the hoop, entertain and generally make a large return on the investment put into you, you are worthy of our praise and our dollars. You are now considered worthwhile in the eyes of the privileged. It pains me so much to say this, but near the end of his life I asked my grandpa why he wasn’t watching some of his favorite sports (basketball and football) anymore, and he told me that he didn’t like arrogant and ungrateful attitudes of this “new generation” of athletes. Then he almost exclusively watched nothing but hockey and NASCAR until he died. It was clear, in his mind, and in the minds of many current fans of the game there are ways these athletes in a predominantly black league need to act. Step out of line and step straight out of our good graces. If I had $10,000 for every student at my school who has “Ball is Life” written on their binder, I could give them the resources they desperately need to succeed on a daily basis—safe housing, enough food and daily living supplies, and money for private tutoring for a year. It wouldn’t cost that much to seriously change some lives in this country. Instead, they use the $20 that they can scrape together, buy a basketball, and literally roll a 40 million sided dice, hoping for their number to come up and they’ll be saved. Why? Because we’ve made it that way. So yes, hockey fans are insecure. We (especially American fans) hate that we feel like the one sane person in an insane world. We know this is the best sport in the world and we just want to scream at every person in the world that doesn’t get that. We are the ultimate redheaded stepchildren of sports and we have a lot on anxiety over our place in that world. I guess all I’m asking for is for some in the big three to start feeling anxiety over their position and power over marginalized populations in our country. This isn’t a debate, but it sure is discussion that a hell of a lot of owners, fans, and players really need to be having. Despite what you may think, this is not a game.